There’s a new assembly that the factory now provides with the XL kit. That means that the instructions in manual six are incorrect. It becamse obvious rather quickly that the old instructions didn’t match the parts that I had. The good news is that the factory did publish an updated set of instructions that are a part of the XL-5 kit which is basically what I’m building. So, while the subheading here talks about section 6.7, what I’m really using to build this out is section 6A-3.1 in the XL-5 supplemental manual. There are quite a few parts that need to be put together for this assembly. It’s actually not that difficult although there are a few tricks that I needed to learn, especially in areas where the manual wasn’t as clear as it could be. Also, I decided to paint the main metal assembly before putting it all together. The steel pipes, as sent from the factory, just had some gray primer on them. I spray painted my assembly a nice, shiny black which I think looks much better. 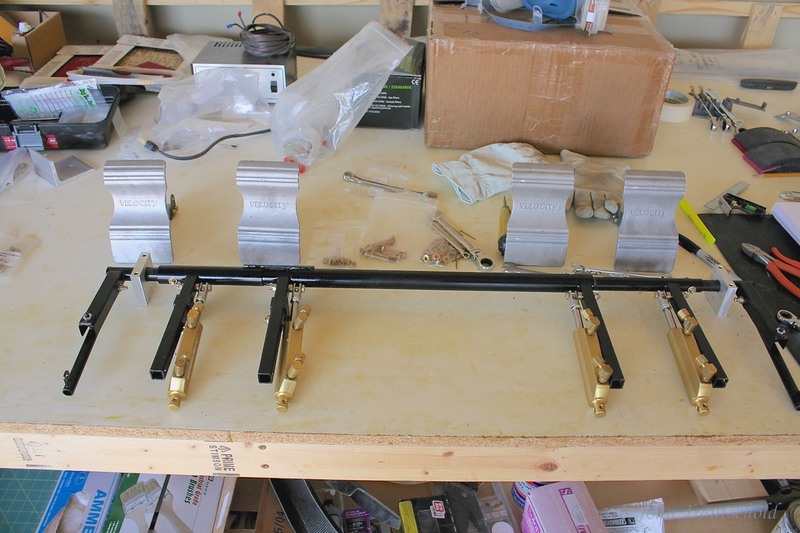 Here are all of the parts for the rudder pedal assembly. I pre-painted the main mechanism black. 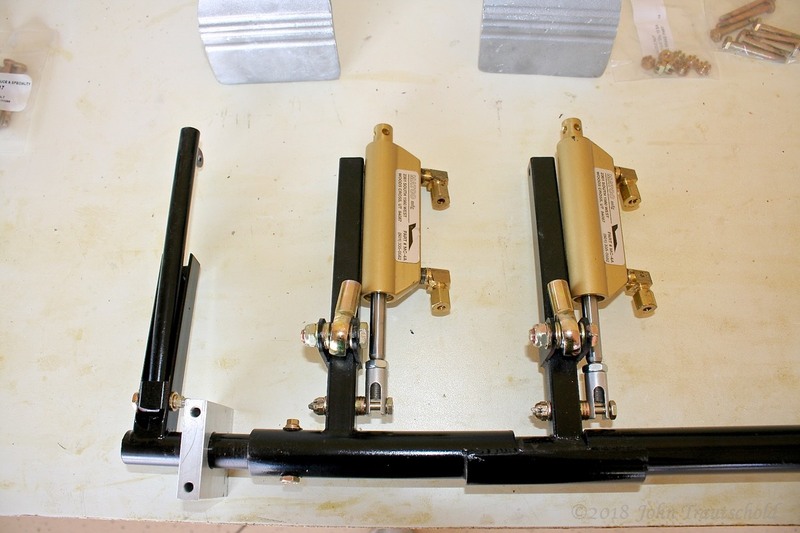 The gold-colored assemblies are Matco brake cylinders, one for the left brake and one for the right. Spacing is critical so that the cylinders don’t rub against the steel brackets. That’s why you’ll see quite a few washers between the top of the cylinder attachment point and the metal bracket. 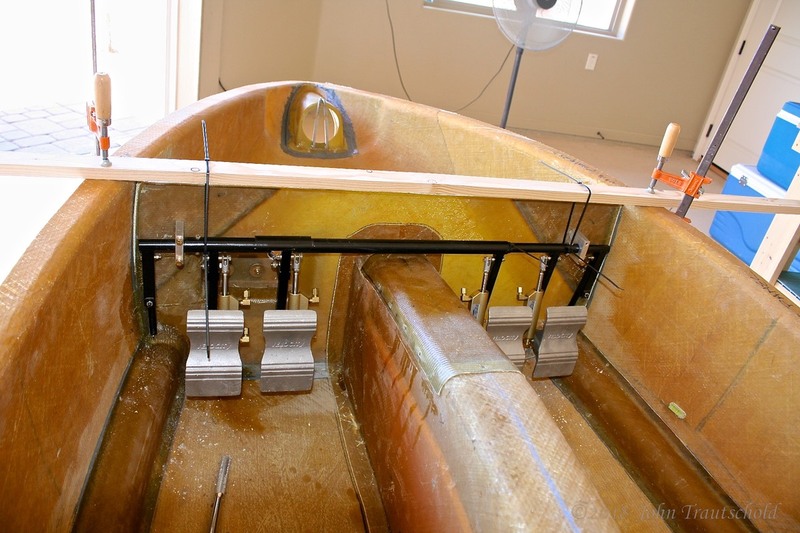 Pedals and cylinders attached on the pilot's side! And here everything is attached on the co-pilot's side! As with everything, before the assembly is attached to the canard bulkhead, it has to be leveled. Before doing that I rechecked the level of the fuselage itself. 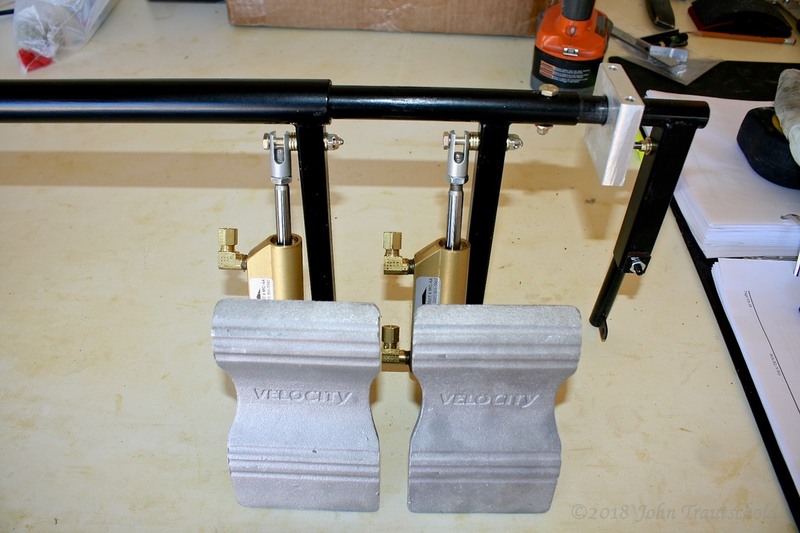 I then needed to come up with a method to level the assembly (which is a bit heavy and awkward to handle) before drilling the holes and attaching it to the bulkhead. Sometimes simple is the best, so I grabbed a board and some tie wraps and used those tie wraps to level it, one “click” at a time. 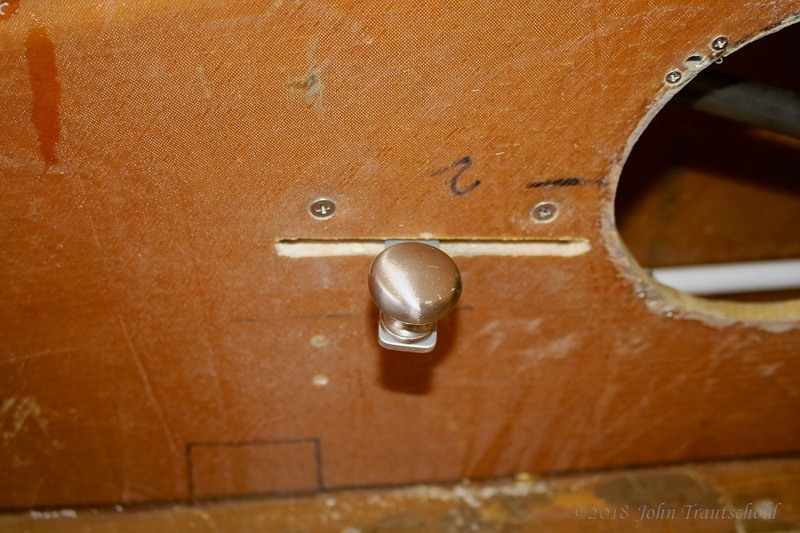 I also needed to set the clearance properly between the assembly and the top of the keel. Since the assembly itself is made out of steel, it made it really easy to magnetically attach my digital level to the center of the assembly for leveling. I don’t show that in the photo below, but trust me, it worked well! Once the fuselage is re-leveled, I then came up with this simple contraption to level the assembly before the final install. And here we see the bell crank (sort of) from the inside of the fuselage. 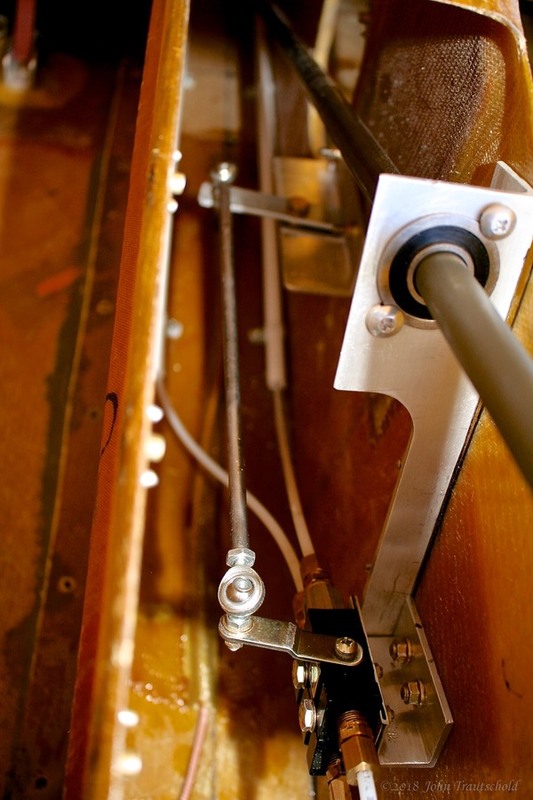 The bell crank locks the two pedals together so that they move in opposite directions. Finally, the brake fluid reservoir gets installed. The manual is very non-specific about where to install this. It just suggests to pick a good location that’s easy to get to, especially when bleeding the brake system. I decided to make some brackets and install it in the nose close to the nose access cover. That should give me great access for bleeding the system without making too much of a mess! Here's one bracket to be used for attaching the brake cylinder reservoir. 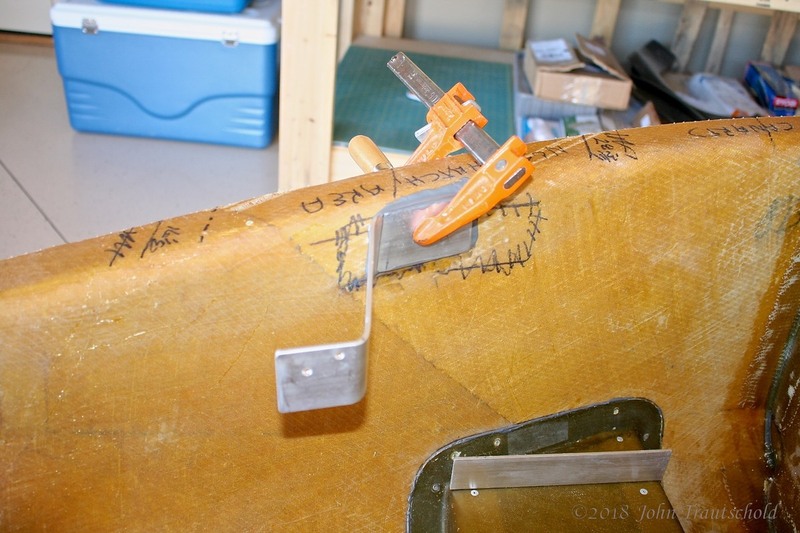 The clamp is holding it in place while the epoxy cures. 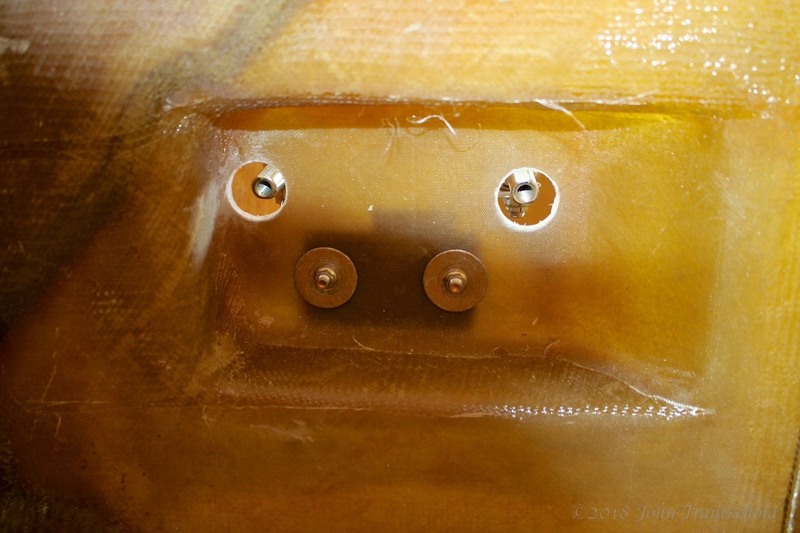 And here's a 2nd view showing the secondary bracket for strengthening. I had to leave room for the battery, which gets installed on the shelf at the bottom right of the photo. 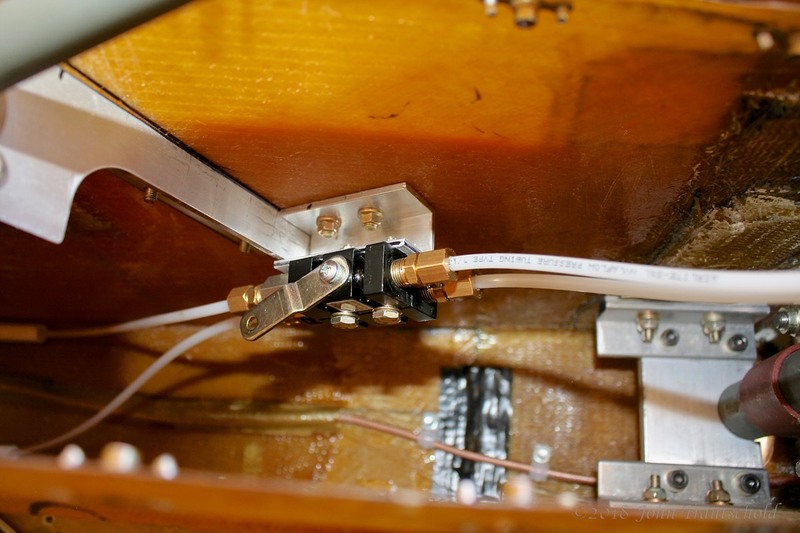 That’s why the brake lines swoop around towards the side of the fuselage. 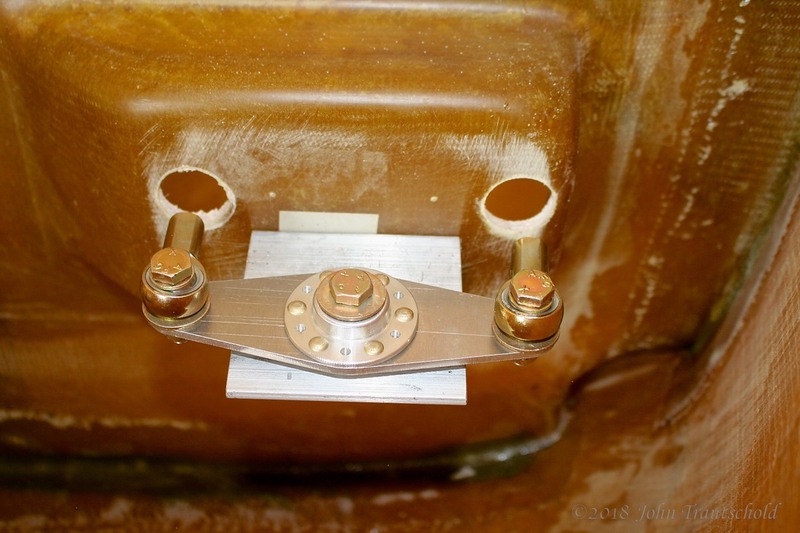 The brake lines pass through the canard bulkhead via some rubber grommets to provide protection and to make it easier for those brake lines to move as the pedals are operated. The next step is to install the optional parking brake valve. 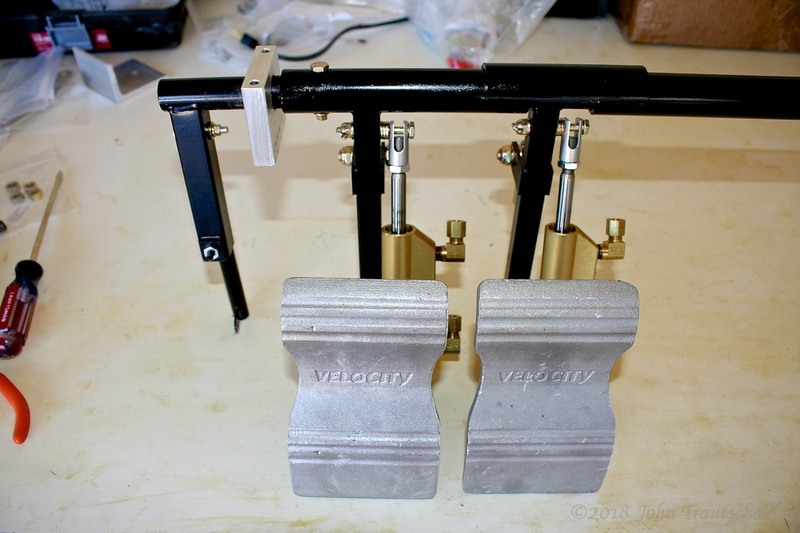 Velocity does not supply this part since not all builders include a parking brake. Because of the hilly situation here at my hangar home, I decided to purchase the recommended Matco parking brake valve from Aircraft Spruce. I decided to mount mine inside of the keel. Here it is installed next to the aileron forward bearing assembly. 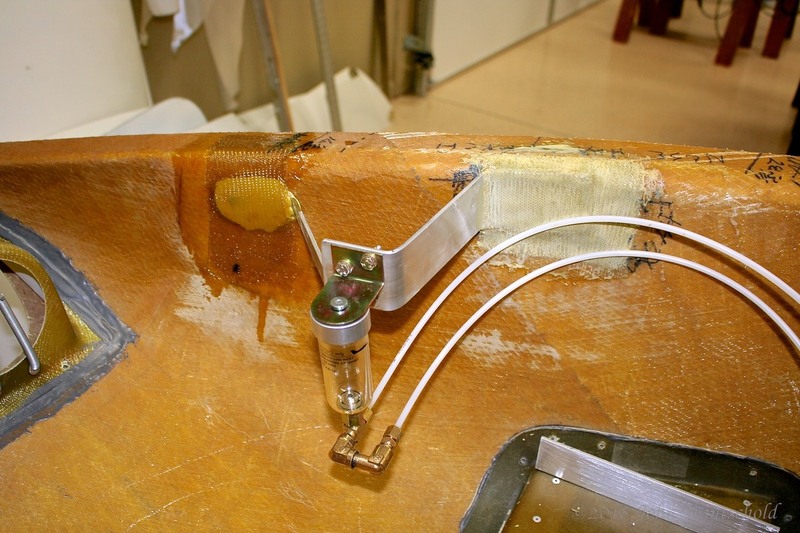 I still need to design a control system for this, but here is the valve attached to a bracket close to the aileron bell crank forward bearing assembly in the keel. It took a bit of engineering but I finally came up with a rather simple method for controlling the parking brake. It involves buying a short piece of steel rod, some rod ends and some homemade brackets. 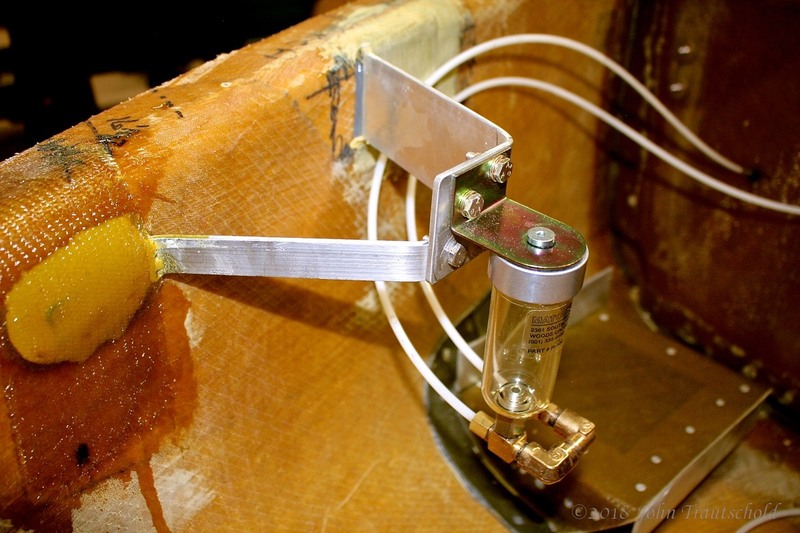 The hardest part of this whole process was tapping the darn steel rod! Tapping aluminum is one thing, but trying to tap steel is another. I swear, it took a good 45 minutes to an hour to tap each end! I didn’t want to break the tap, and even with using copius amounts of tapping oil it still took forever. Thank goodness that’s done now! Here’s a photo of the finished product. My camera wasn’t able to keep the entire assembly in focus, but you get the idea. I had to invent a mechanism to control the parking brake valve (black device at the bottom of the photo). A steel rod, some rod end bearings and a homemade bracket (out of focus at the top of the photo) and it's all done! I created a simple lever that sticks out the same amount that the lever on the parking brake valve does. After creating a pivot point about equal to the pivot point on the valve, I was in business. It seems to be working perfectly. 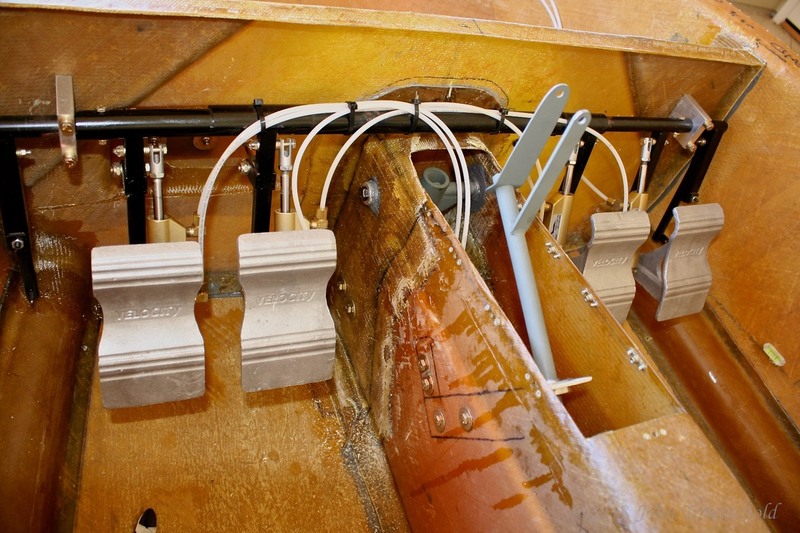 Here’s a photo of the pilot control on the outside of the keel. And here's the other end of the parking brake control. The knob comes from Home Depot! Finally, other than the brakes themselves, all of the brake line plumbing is now complete. Let’s hope nothing leaks when I eventually load it up with brake fluid! All of the brake line tubing is now installed and ready for some fluid. It’s starting to get tight inside the keel. For now, the next step is to install the main spar. Click here for that process!